So... "weeaboo" is a derogatory term for people who are fascinated with Japanese culture to an obsessive, socially uncomfortable level. They'll gush over minutiae about Japanese culture while sidestepping some of the more problematic aspects of it. 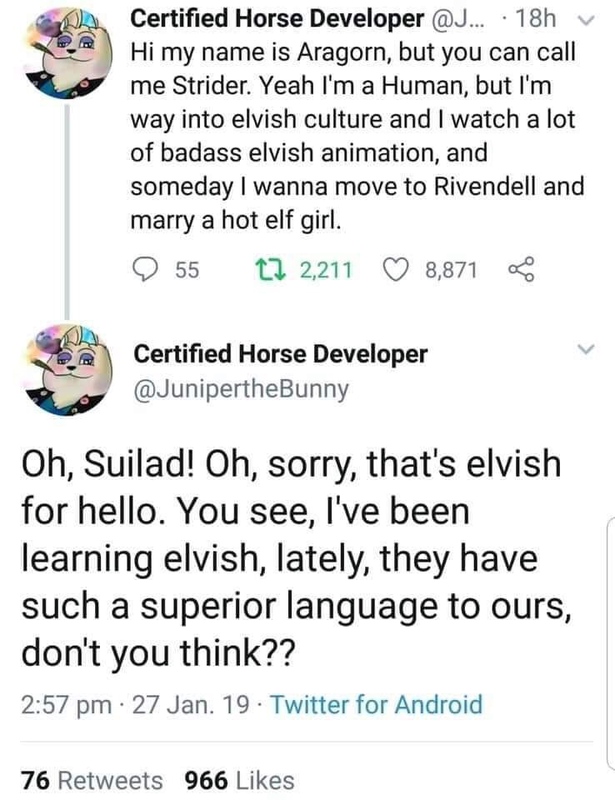 A friend in our D&D 5e campaign is playing a she/her half-elf, and wrangled a deal with a he/him shop-owner who fancies himself an elf scholar. He may additionally be interested in the PC, or simply worshipful of her culture. What tips can you guys provide on how to really land the squirminess of an "elfaboo"? I think with that picture you have your answer. I'm gonna have the elfaboo correct the Elf's pronunciation of various words while they speak. chronovore in the middle of the speaker's sentence, too. Don't wait for them to finish. You're ready for this shop keeper to die, right? Because I'd kill them. I'm absolutely hoping that will happen. Plus, there are riots in the streets, so it may not even get blamed on them. I'll probably pass a note to the rogue mentioning that. My murder hobos have been all too civil recently. You can incorporate a "lovely" thing that happened to me one day if you'd like - someone corrected me on the name of the place my family is from! I love your race-ism - beautiful! komradebrownies I’m up for that elsewhere but the guy is running a legit magic shop. Maybe I should have this be his one big blind spot?